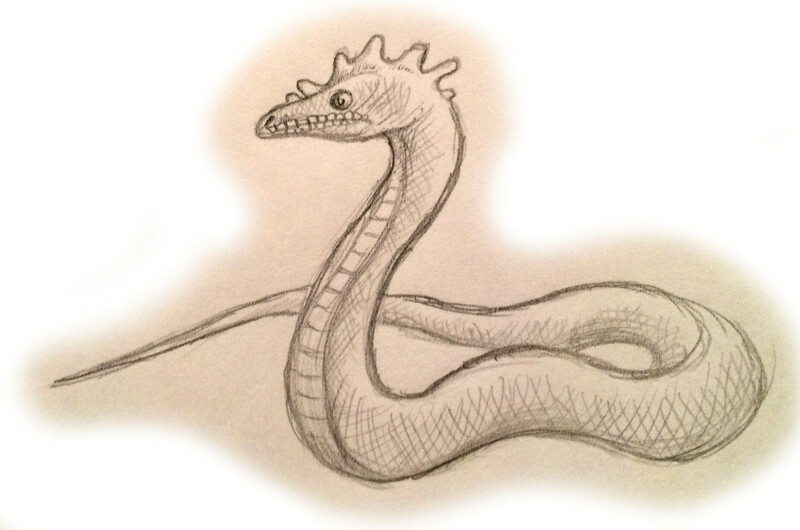 The Basilisk, the “little king” or “king of snakes”, is best known as a creature whose looks kill. Its primary claim to fame is a gaze that instantly kills anyone who sees it, or even anyone it looks at. The basilisk has appeared under a number of guises throughout the centuries, but there are at least a few constants. It is always deceptively small. 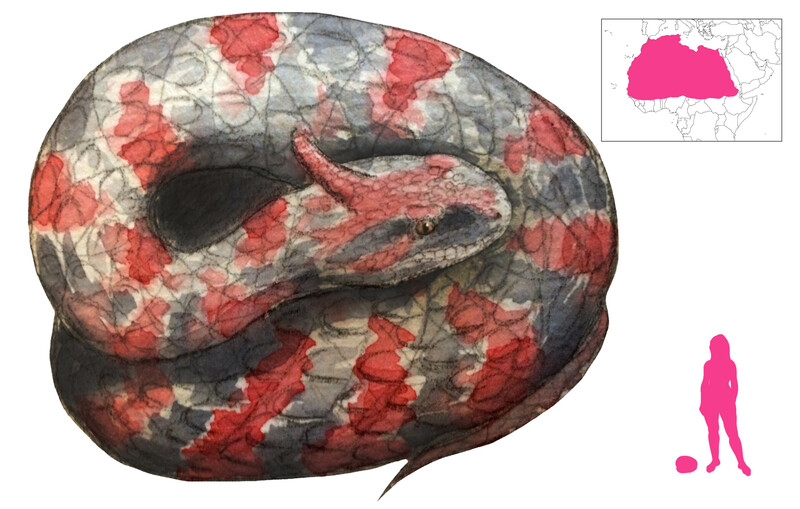 It is a snake, or at least part snake, with or without rooster characteristics. It always has a crown – whether a white mark, a ring of hornlets, a rooster’s comb, or even a literal crown on its head. And finally, it is always extraordinarily virulent. The basilisk is first and foremost a snake, born from the blood of Medusa as were all venomous snakes. It is found in the North African deserts – its very presence causes the desert, and it becomes frantic in the presence of water. At half a foot long, it is far from the biggest snake, but it is the king of snakes, traveling proudly with its head off the ground. It has a white spot or a crown on its head, and white markings down its back. The exact nature of the basilisk’s deadliness is uncertain, as it is known to kill via venom, odor, and gaze. Murrus, one of Lucan’s soldiers, transfixed a basilisk with his spear, only to see the venom travel up his weapon and start corroding his hand. He survived by amputating his arm before the venom could reach his body. A basilisk can spit its venom skyward, frizzling up birds in flight. Its very gaze is deadly, as it can kill a man merely by looking at him with its gleaming red eyes. The regal nature of the basilisk and its propensity for projecting its venom suggest that cobras or spitting cobras were the origin of the legend. Basilisks feared only three things: weasels, the crowing of roosters, and their own lethal gaze. The weasel was the only animal immune to the basilisk’s gaze and venom, making it the only natural predator of the king of snakes. Weasels were often sent into caves believed to harbor basilisks. This interaction also recalls that of the cobra and the mongoose. Basilisks also convulsed and died instantly upon hearing the crowing of a rooster. Travelers in the Libyan desert would be well advised to bring a rooster along with them. Topsell denied the possibility of basilisks perishing upon seeing each other, as “it is unpossible that any thing should hurt itself”; nonetheless, a basilisk in Vienna was killed by showing it a mirror. With the passing of time the nature of the basilisk grew more and more confused. Various Biblical serpents were translated as basilisks. The basilisk gained more avian characteristics, including an origin in rooster eggs, and was confused with Cocodrillus (the crocodile); both of them were dangerous reptiles with small adversaries (the weasel for the basilisk, the hydrus for the crocodile). 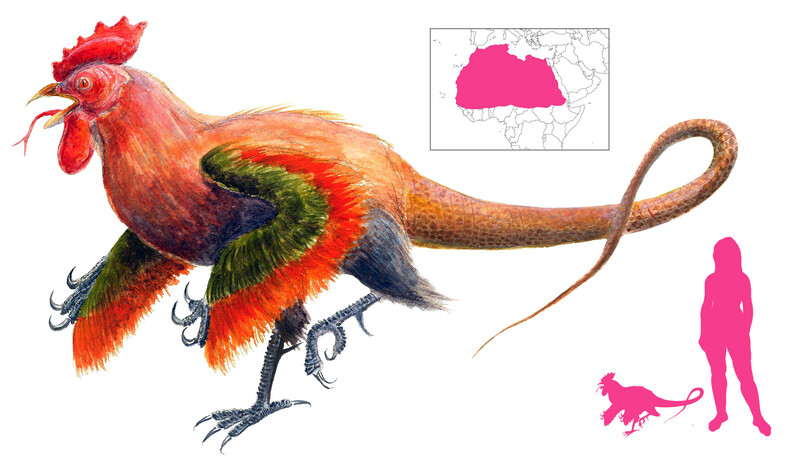 Further garbling of “cocodrillus” resulted in “cockatrice”. Wycliffe’s Bible had “cockatrice” as a translation of “basilisk”. Chaucer referred to the “basilicok”. 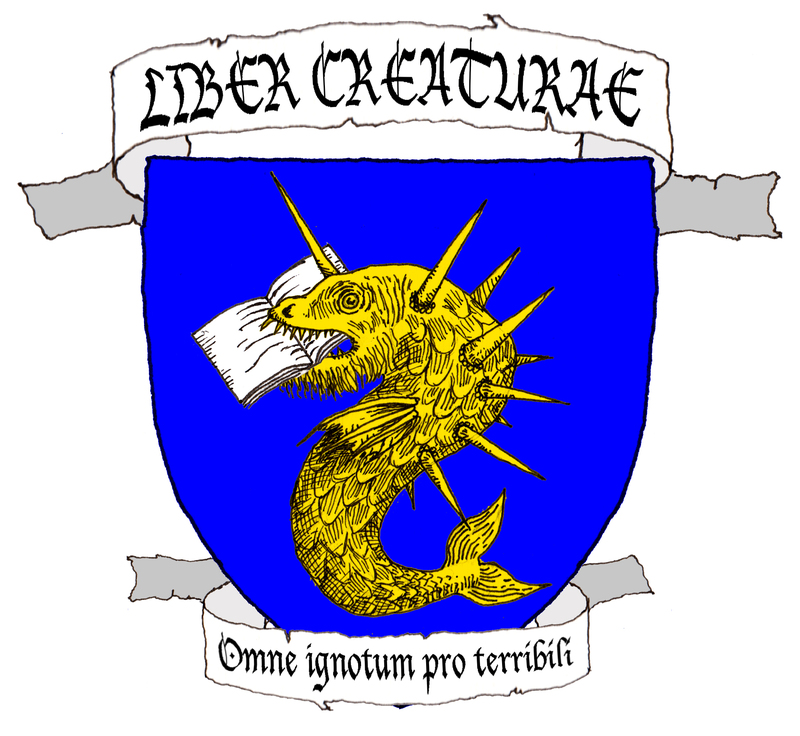 With the accumulation of translation, grammar, and etymological errors, the basilisk (or cockatrice) became a hybrid of snake and rooster, with clawed wings, a rooster’s head, and a long serpentine tail (sometimes with an additional head at the end). This is the familiar cockatrice (or basilisk) of bestiaries, and an incarnation of the Devil himself. 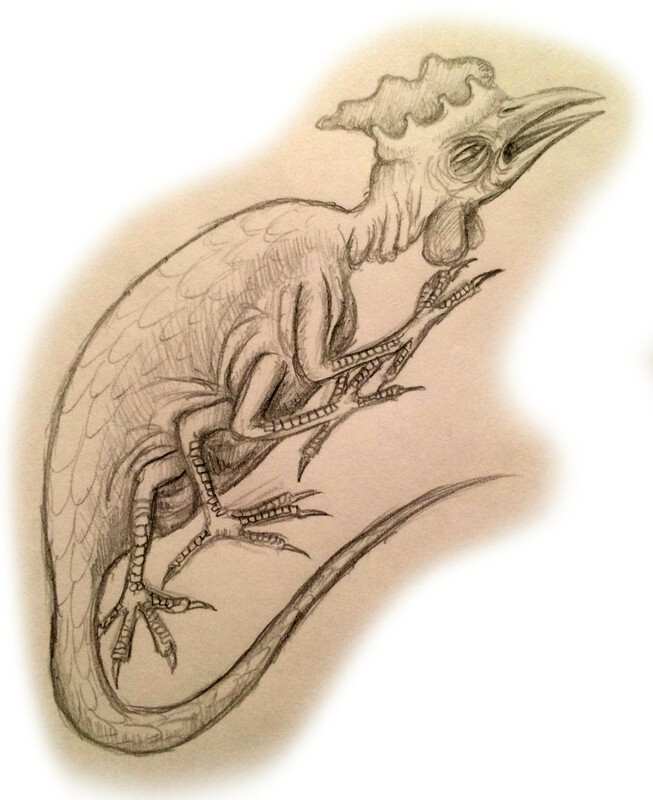 It further evolved into the alchemical cockatrice, holding its tail in its mouth, symbolizing the alchemical cycle and its mixed nature. The same nomenclatural confusion also gave rise to the Codrille, a basilisk from central France. Despite efforts to separate the basilisk and the cockatrice – for example, making the basilisk a snake or lizard and the cockatrice a snake-rooster hybrid, or making them both snake-rooster hybrids, one with a snake head and the other with a rooster head – the fact remains that the names basilisk and cockatrice are interchangeable, and refer to the same animal. It is best to accept T. H. White’s statement that the cockatrice is “a medieval muddle” and leave it at that. Cardano reported a basilisk found in the ruins of a demolished building in Milan. 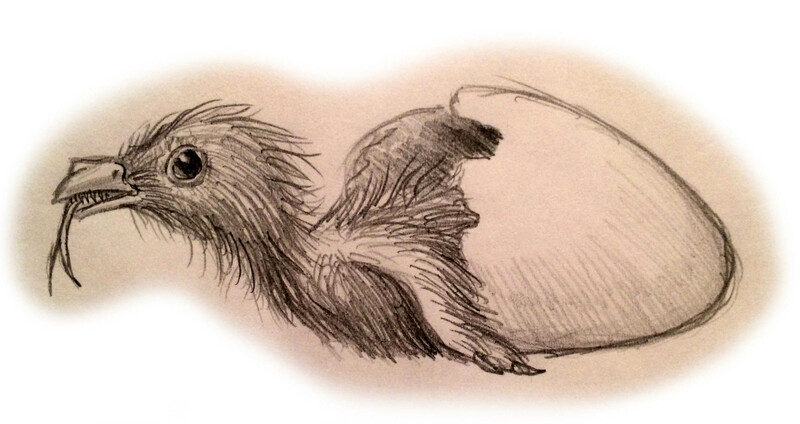 This particular specimen was wingless and featherless, with an egg-sized head that looked too large for its body. It had viper fangs, a bulky lizard-like body similar to that of the stellion, and only two stubby legs with catlike claws. The tail was as long as the body, with a swelling at its tip the size of the head. When standing up, it looked like a leathery, naked rooster. Aldrovandi was apparently inspired by this animal for one of his images of the basilisk, helpfully giving it six more legs. Based on the description and appearance, it appears to have been inspired somewhat by scorpions. Ironically, while this eight-legged depiction has proven particularly enduring, Aldrovandi himself was apparently doubtful of its authenticity, placing this presumed African creature just before a couple rays preserved in the shape of basilisks. The true, snake-like basilisk is given a full-page spread. Aldrovandi also produces a couple of purported basilisk eggs. Finally, Hichens’ “crowing crested cobra” of sub-Saharan Africa appears to be some kind of basilisk. It resembles a cobra, but with a crest on its head and the call of a rooster. The life cycle of the basilisk is involved and complicated. The Egyptians believed it to be born from the egg of the ibis, while Neckham blames chickens. Basilisks are born from round shell-less eggs laid by old roosters in the summer (on a dungheap, in some accounts). Those eggs have to be incubated by a snake, a toad, or the rooster itself, eventually producing little terrors ready to kill at birth. As roosters may develop concretions that resemble eggs, and hens may look like roosters, any such fowl that seemed to be a male chicken laying an egg was immediately put to death. In 1474, one such heretical chicken was burned at the stake in Basle, in front of a large crowd. The only plant immune to the withering gaze of the basilisk is rue, which is consumed by weasels to protect themselves from their enemies. Remedies for basilisk envenomation will always contain rue. A dead basilisk will ward away spiders, and one such basilisk carcass in Diana’s temple kept swallows at bay. Borges quotes Quevedo as giving the paradox of the basilisk: its existence cannot be proven, as anyone who sees it and survives is a liar, and anyone who sees it and dies will not tell the tale. The basilisk of biology, or Jesus Christ Lizard (Basiliscus) is a completely harmless South American lizard, known for walking on water. The lethal powers of the basilisk were also transposed by European settlers onto rattlesnakes, and the Mexican West Coast rattlesnake still bears the name of Crotalus basiliscus. Aelian, trans. Scholfield, A. F. (1959) On the Characteristics of Animals, vol. I. Harvard University Press, Cambridge, Massachusetts. Barber, R. (1993) Bestiary. The Boydell Press, Woodbridge. Breiner, L. A. (1979) The Career of the Cockatrice. Isis, vol. 70, no. 1, pp. 30-47. Breiner, L. A. (1979) Herbert’s Cockatrice. Modern Philology, vol. 77, no. 1, pp. 10-17. Brown, T. (1658) Pseudodoxia Epidemica. Edward Dod, London. Bulfinch, T. (1997) The Age of Fable. Macmillan, New York. Cardano, G.; le Blanc, R. trans. (1556) Les Livres de Hierome Cardanus Médecin Milannois. Guillaume le Noir, Paris. Evans, E. P. (1987) The Criminal Prosecution and Capital Punishment of Animals. Faber and Faber, London. Hargreaves, J. (1983) The Dragon Hunter’s Handbook. Armada. Lemnius, L. (1658) The Secret Miracles of Nature. Jo. Streater, London. Liss, A. R. (1987) A Basilisk by Any Other Name… Teratology 35, pp. 277-279. Sax, B. (1994) The Basilisk and Rattlesnake, or a European Monster Comes to America. Society and Animals, vol. 2, no. 1. White, T. H. (1984) The Book of Beasts. Dover Publications, New York. 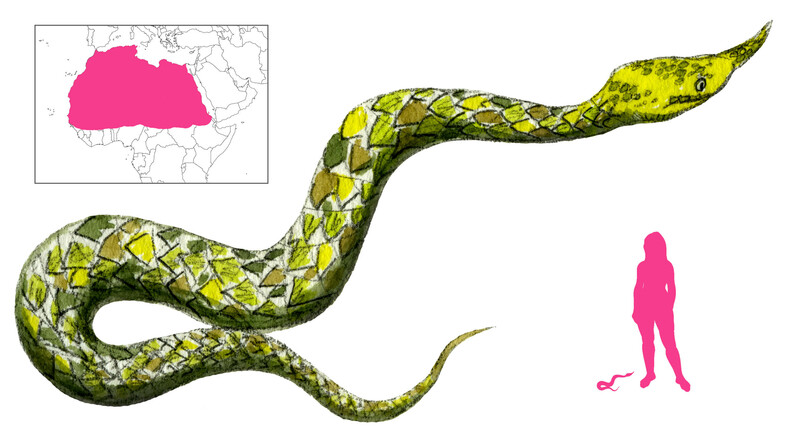 The Seps – “putrefaction” – is a deadly snake found in the deserts of Africa. It is especially feared for its corrosive venom, which melts flesh and bone alike to leave its victim a smear on the ground. Lucan awarded it the title of Libya’s greatest plague. A seps is about two cubits (about a meter) long, and varicolored along its length; some say it can also change color like a chameleon. It uniquely has four hollow fangs in its lower jaw. Topsell attests to its speed, describing its motion as going “by spires and half-hoops”, possibly a reference to sidewinding. Aldrovandi gives the seps a horn on the nose and large triangular scales. Seps can be found in valleys, deserts, and under rocks. They can survive winters thanks to their natural warmth. Seps venom is highly virulent, causing massive necrosis and putrefaction of tissues. Skin, muscle, blood, bone – everything rots and dissolves away, and if the bite is not treated, the victim literally melts into oblivion, leaving nothing behind. Eldred points out that the original Greek seps killed in the same way as the dipsas – by inducing extreme thirst. Lucan alters that to better suit the snake’s name. For antivenin, Topsell recommends the same measures as with other venomous snakes, as well as sponges soaked in warm vinegar; a concoction of ashes, butter, and honey; or otherwise millet, honey, bay, oxymel, and purslane. Lucan describes the fate of a Roman soldier after being bitten by a seps. The unfortunate Sabellus’ skin, flesh, and sinews shriveled away from the bite, exposing bare bones before they, too, succumbed to the venom. The putrefying venom worked its way upward from the bite, and the soldier melted like a candle. 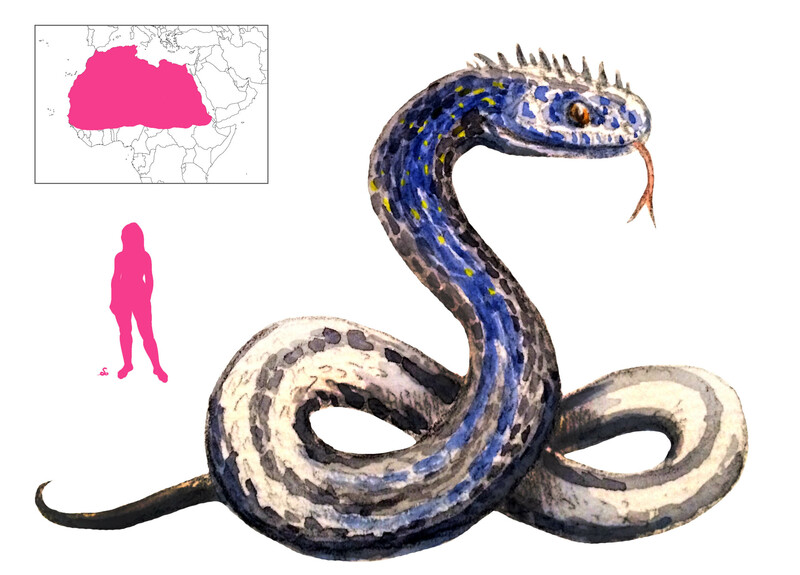 While no snake has venom as powerful as that of the seps, the symptoms of seps bite seem to be an exaggeration of actual necrosis caused by snake bite. 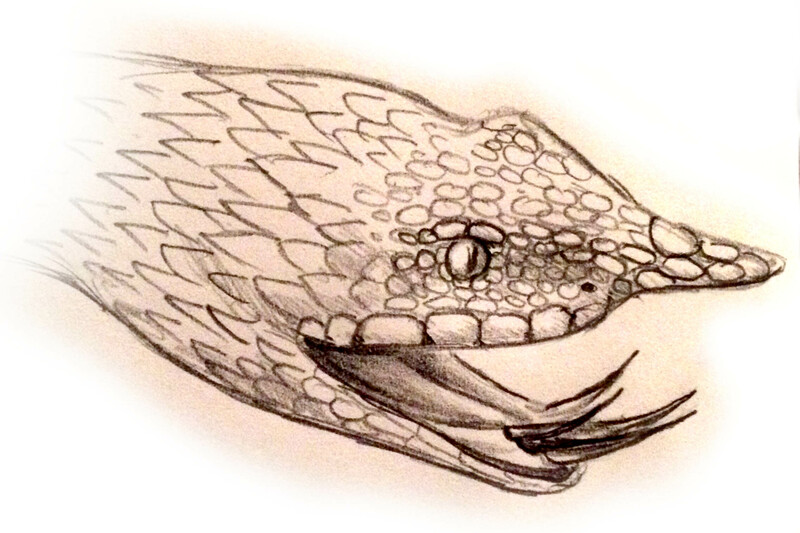 The Dipsas – “thirsty” or “thirst-causer”, among its many names – was one of the deadly snakes encountered by Cato’s army in the African desert. It was feared for its venom, which induced unquenchable, desperate thirst in its victims. Aelian and Aldrovandi believed it to be the same as the prester, a conclusion which Topsell disputed. Aelian points out that the dipsas is white with two black stripes on its tail; Topsell mentions its black tail and black-and-yellow spots on its anterior; Aldrovandi pictures it with longitudinal black and white stripes and prominent scales on its head. Dipsades may be found near sources of water, including springs and marshes, and they will also lie in wait in ostrich nests. The small size of the dipsas makes it easy to overlook, and its bite is painless; its victims often are oblivious to the cause of their unnatural thirst. The venom seeps into the bones, sets fire to the organs, absorbs vital fluids, and parches the tongue and throat. Sometimes victims are driven to drink so much that their stomachs explode; if there is no water around, they eventually succumb to internal burning. Lucan describes the effect of a dipsas bite on the Roman standard-bearer Aulus, bitten after he accidentally stepped on a dipsas. No amount of water could quench his thirst, and, after trying in vain to drink up a river, he tore his wrists open in a last-ditch effort to drink his own blood. His suicide was practically a mercy. Aelian mentions a tale told where a donkey, charged by Zeus with bestowing immortality on mankind, stopped by a spring to drink. That spring was guarded by a dipsas, which refused to allow the donkey to drink until it had given it the secret of immortality – and since then, the snake sheds its skin and rejuvenates itself, while humans, much like the unfortunate Gilgamesh, lost their chance at eternal youth. This story was also told by Sophocles and a number of other authors. Dipsades also guard a spring in the Pharsalia, and Cato (correctly) points out that snake venom is harmless in water. In both of these cases, we have the dipsas causing thirst not by its bite, but by denying access to water. The descriptions of dipsas venom may be close to the actual effects of some snake venoms, notably the burning sensation and the parched throat. Nowadays Dipsas refers to a genus of New World snakes that only pose a threat to snails and slugs.